When you shop for pretty much anything—clothing, cosmetics, cleaning products, storage solutions, houseware, etc.—you have the choice to choose an eco-friendly product. It may not always be the cheapest or most convenient option, and we all lead busy lives, but the option is there. In February, we want to challenge you to consider replacing some of your household staples with an eco-friendly alternative. According to the Environmental Professionals Network, an eco-friendly product means a product does not harm the environment, both in the production of the item and in the use of the product. Why use more eco-friendly products? People who use environmentally friendly products help reduce pollution and contamination of our environment. Beyond their impact on the environment, eco-friendly products can provide you with a healthier lifestyle. Because eco-friendly products are made with natural ingredients rather than harmful chemicals, they reduce your risk of developing illnesses and diseases. How can I incorporate more eco-friendly products into my lifestyle? You don’t have to replace every non-eco-friendly item you own in one big shopping trip. Making more eco-friendly decisions little-by-little over time adds up to a great impact on our environment and on your life. Below we’ve rounded up 5 simple replacements to consider. Hosting a party soon? Think twice before you spend money on one-use plastic silverware and paper plates. 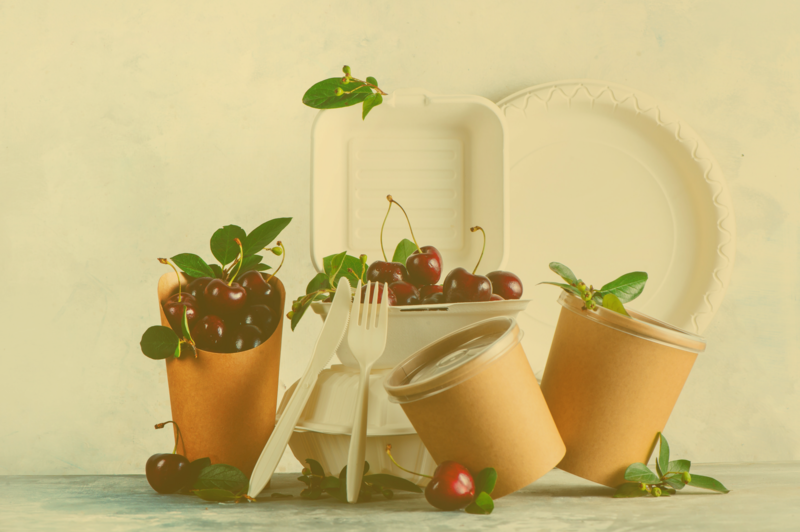 Consider eliminating waste without sacrificing convenience by choosing compostable forks, spoons, knives, and plates. BARC has all of this in our online shop! Check out our compostable serviceware here. Many cleaning supplies are made with harsh and harmful chemicals. Luckily there are many companies that make great eco-friendly alternatives. This month consider replacing some of your cleaning supplies with natural alternatives like the one linked below, or, try to make some of your own cleaning supplies with basic ingredients you may already have in your pantry (like lemons, baking soda, and vinegar). Instead of throwing away dryer sheets every time you dry a load of laundry, consider buying wool dryer balls that last 1,000+ loads instead. They not only reduce use of wasteful dryer sheets, but also save energy by reducing drying time! Every day, over 3,000 tons of paper towel waste is produced in the US alone. By switching to cloth towels and napkins or choosing an eco-friendly paper towel such as bamboo paper towels, you can be a huge part of changing that trend. If every household in the US replaced just ONE roll of paper towel with recycled paper towel, we could save 544,000 trees. There are so many more eco-friendly replacements than the ones found above. From dog waste bags, to your own trash bags, to your coffee filters, and even your sandwich bag! What are some of your favorite eco-friendly products? Share them with us this month on social media, using the hashtag #greeneryearchallenge!